Principal Partner LL.B., Dip. L.P., N.P. 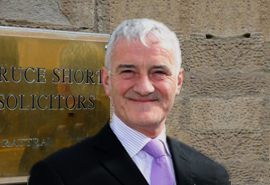 Michael Short founded Bruce Short Solicitors in 1988 having developed a passion for criminal law after completing his traineeship. Michael deals primarily in Criminal matters, however, he also deals with legal issues arising in Mental Health law. Michael can act as a Notary Public.